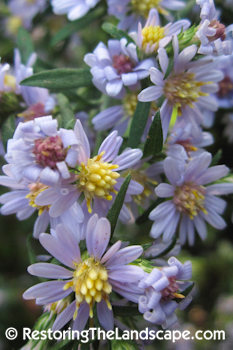 Heart Leaved Aster is a native, shade tolerant perennial. Its flower color ranges from light blue to purple and is a favorite nectar source for syrphid flies and bees. 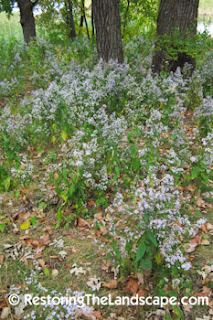 Heart Leaved Aster does well in dry upland sites. It does spread by seed very easily, especially if you plant it in moist rich soils. 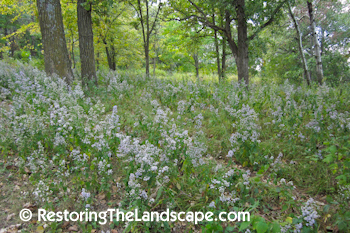 This photo is of a local park being restored, the buckthorn (Rhamnus cathartica) has been removed and the Heart Leaved Aster is doing a wonderful job of seeding into the understory. Some would consider this an aggressive plant, as it looks like it is currently dominating the understory. It is however filling voids that would either be used by non-native naturalized or invasive species. There are plenty of earlier flowering natives that have faded into the background too. As the restoration and succession of this woodland progresses, more species will return via the seed bank or through reintroduction by the city. So if you have a dry shaded site where you want more color this time of year, try planting some Heart Leaved Aster, the pollinators will thank you.